Can nanotechnology save LCD TVs? (Nanowerk Spotlight) Many of us don't like to admit it, but televisions are an important part of our lives. Technology has improved the quality and convenience of TVs and has given us a whole new set of choices – high definition, plasma, and liquid crystal displays. With an estimated 66 million sets to be sold this year, flat-screen LCD televisions are the most popular choice. Much of the reason behind the popularity of these high-tech wonders is the decrease in price that happens with most cool technology – a few years after they have been on the market. But, for the popular LCD TV, a shortage of a key compound used to produce LCDs may force manufacturers to raise prices. Electronics suppliers are facing a shortage of the rare metal indium, a co-product of zinc mining. Indium is a rare, malleable and easily fused metal, similar to aluminum, which is used to make indium tin oxide (ITO), the standard transparent electrode used in nearly all flat panel displays and microdisplays. Indium is expensive and scarce and demand is increasing. According to Displaybank, the demand for indium was 861 tons in 2006 and may reach nearly 2000 tons by 2011. Five years ago, indium was about $100/ kg; now it costs $800/kg. Displaybank expects the total sales of indium in 2007 to be $533 million. But, geologists say the cost of indium may not matter soon, because the earth's supply of it could be gone in four years. This could put a serious damper on that 52" LCD screen you've been dreaming about. Fortunately, with the help of nanotechnology, a team of scientists in Japan have developed a new material that may replace the need for indium in LCD production. Transparent substances such as jewels and glass are generally not conductive. Transparency means that there are no free electrons to scatter light, and therefore, transparency and electronic conductivity are not very compatible; and the oxides of the light elements, such as Ca and Al, are insulators. By altering the crystal structure of ordinary alumina cement at the nano-level, Professor Hideo Hosono and his team of researchers at the Tokyo Institute of Technology, have developed a compound that conducts electricity as well as manganese and other metals. Their research results were published in a recent issue of Nano Letters ("Metallic State in a Lime-Alumina Compound with Nanoporous Structure"). Regular alumina cement, which is made from a lime-alumina compound (C12A7), has a crystal structure consisting of asymmetric cages. These asymmetric cages are poor conductors of electricity. However, by sealing the nano-compound with titanium in a glass tube and heating it to more than 2,000° F. (1,100° Celsius), Hosono and his research team were able to change the structure, creating a homogenized, symmetrical cage which conducts electricity. Tests indicate that the nano-cement’s electrical conductivity is comparable to that of manganese at room temperature and as its temperature decreases, its conductivity increases. The team developed several processes that enable the free oxygen ions in C12A7 to be completely replaced with electrons, resulting in a metallic conduction with a sharp enhancement of the drift mobility. Initially, reducing processes such as Ca vapor treatment results in a replacement of the free oxygen ions with electrons. Since the Ca treatment is very slow (10 days for a 0.4 mm thick sample) to extract the free oxygen ions, the researchers have devised a titanium treatment of the C12A7 single crystals to dope electrons. Hosono's team observed that the insulating C12A7 is converted to a metal by replacing more than half of the free oxygen ions by electrons. 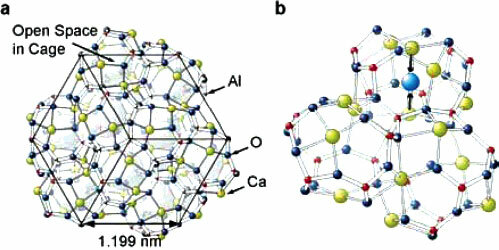 They note, though, that the doping and conduction mechanisms in C12A7 are much different from those in conventional semiconductors due to the unique crystal and electronic structures of C12A7. The cement could be made nearly transparent by slicing it into thin membranes, creating an ideal substitute for rare metals like indium. This discovery is the first time an insulator-to-metal (IM) transition has been observed in a light metal oxide. So far, nanotechnology’s expectation for electroactive functions has been limited to specific porous materials such as carbon nanotubes, because other porous materials lack conductivity. The researchers in Japan say that the keys to realizing metallic C12A7 are to utilize the free space of the cages embedded in the unique nanostructure of the C12A7 crystal and to suppress the local lattice relaxation upon the electron doping. The researchers believe the process can be used to achieve the same metallic state in numerous other compounds, making various abundant light oxide metals—formerly believed to be useful only as insulators—capable of conducting electricity. The fascinating perspective opened up by this kind of research could mean that in future materials engineers could take commonly available and abundant materials and 'tease' novel functions out of them, turning them into more valuable materials and allowing to replace rare and precious materials. This means the future of LCD displays may be safe after all. It also means that readily available (and inexpensive) light metal oxides may replace other rare materials in electrical applications.